On a fine day at the end of March I scattered a variety of salad seeds into growbags in the hope that at least some of them would sprout and provide us with some tasty leaves. Each morning I would pop into the garden(well, more yard really) to check on progress, give them a bit of a talking to and water when they were looking dry(hardly ever as it’s been so rainy). Results have been thrilling, to be honest, and this morning the scissors came out and some of the leaves got a serious haircut. 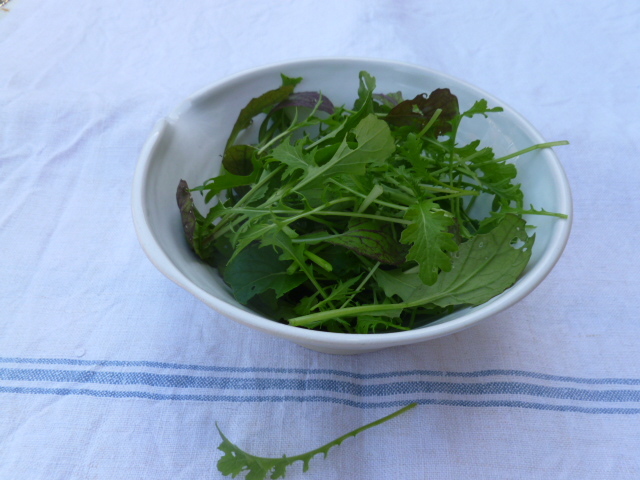 Top of the crops was the oriental salad leaves(Mr Fothergill’s http://www.mr-fothergills.co.uk/?gclid=CKSz7rixvMUCFernwgod8j0AV ) which came up a treat and tasted crisp and peppery. The seeds were a mix of mizuna, pak choi and oriental mustards and looked very pretty with their shades of greens and reds. 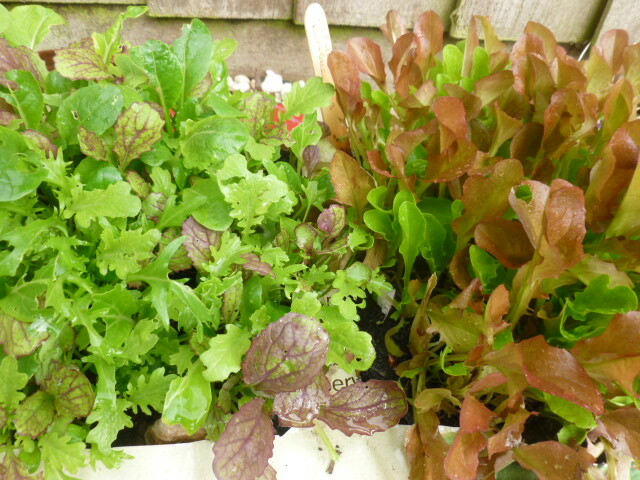 The mixed lettuce(again Mr Fothergill) are also brilliant, as are the mizuna, but I’m letting these get a bit bigger. Apparently, the bigger the leaves the hotter the flavour so these will be good stirred through some spicy pan fried chicken. The wild rocket is still in it’s infancy and to be honest the mesclun is a bit patchy- these are French seeds so maybe they don’t travel well. The leaves I have cropped should grow again, at least three or even four times which would be marvellous and a superb return on the small amount of time and money I have invested. So if you feel like giving micro-gardening a go, either in grow bags, a window box or any spare container here’s a recipe to get you inspired. I discovered wheatberries last year while working on a scandi food feature and their nutty flavour makes a great base for this salad. If you can’t find them then use farro instead, it’s pretty much the same thing. 1 Cook the wheatberries in plenty of water following the pack timings. Drain well and leave to cool. Tip the onion into a large bowl with the lemon juice and mix well. Leave for a few minutes until the onion turns pink. Add the pistachios, cranberries, tomato and mint but don’t stir yet as this will turn the mint leaves brown. 2 Heat 1 tbsp of the oil in a pan, cut the halloumi into six slices and fry quickly on each side until golden. Stir the remaining oil and wheatberries into the onion mix and season with salt and pepper. 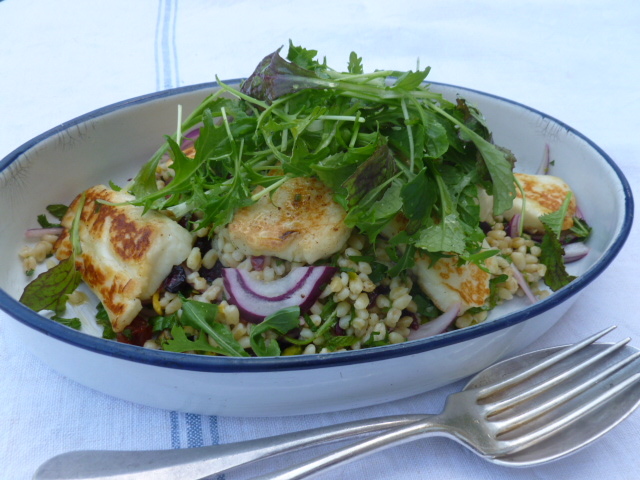 Tip into a shallow dish and top with the halloumi. Scatter over the salad leaves and drizzle with a little olive oil. This entry was posted in Uncategorized and tagged gardening, halloumi, mizuna, mr Fothergill's, rocket, salad, vegetarian, wheatberry on 12th May 2015 by marycadogan.